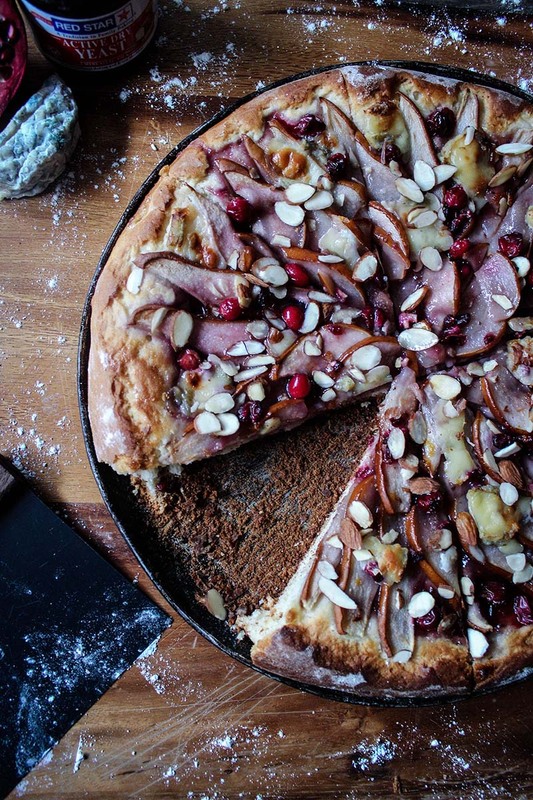 This pizza is a perfect addition to your holiday or special event menu. With its impressive mix of seasonal produce, a spike of Grand Marnier, and nutty-sweet crust, everyone at your table will find something to like about this dish. It's a great appetizer and would be an even better dessert topped with vanilla bean ice cream. In a mixing bowl, whisk together water, 1 tablespoon of granulated sugar, and yeast. Allow mixture to sit for ten minutes or until bubbly. Meanwhile, sift together almond meal and flour in a separate bowl. To the yeast mixture, add olive oil and honey, stir slightly with a wooden spoon. Next, slowly add in your flours, a fourth of a cup at a time, stirring slowly and continuously until a dough forms. Turn dough out onto a floured work surface and knead until springy (smooth and elastic), about 7 minutes. Rest in an oiled bowl, covered, for one hour or until doubled in size. While dough is resting, preheat oven to 450°F. Bake for 35 minutes or until crust is golden brown. Serve immediately. Cover leftovers with plastic wrap and refrigerator for up to one day. Recipe created by Fig and Bleu. This recipe makes one large 12-inch pizza, but you can make smaller pizzas - divide the dough and toppings accordingly. Smaller pizzas will have a shorter bake time, so begin checking at the 20-minute mark for doneness. Feel free to adapt to any season with any fruit, or adjust to make personal pizzas if you so choose. The crust is, at its core, a blank canvas for your palate to paint upon.